We are working on a list of movie references. Stay tuned. 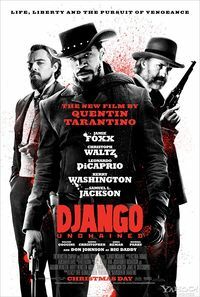 Disclaimer: Movies listed here are a mix of movies that might possibly have influenced Tarantino in making this movie (so those are guesses) and movies that are directly or indirectly referenced to or more or less openly paid hommage to by Tarantino (such as "Django" oviously). This is of course the seminal movie by Corbucci which in parts inspired Tarantino. This is a spaghetti western, one of Corbucci's early works, and also the title of a saloon in Django Unchained. A definition is given as to what the term means. A punishment cell for slaves used in the film.